In 1932 Geoff’s father was a warden at Overton Hall Youth Hostel in Derbyshire. Geoff has a set of photos on flickr named Overton hall. Last week a lady called Maggie got in touch with Geoff after finding these photos on flickr. She now lives in part of Overton hall and is keen to collect as much history about the place as possible. Maggie told Geoff that this weekend they intended to open the Overton Lead mine once again,and he was more than welcome to attend. 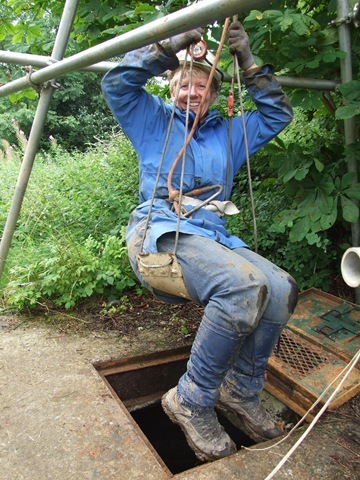 So that’s how I found myself at Overton hall yesterday going down an old lead mine. I was not quite sure what to expect and my first reactions were ones of shock. 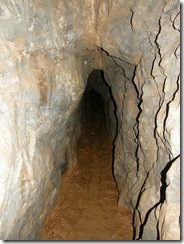 To get into the mine you had to be winched down 80 foot on a small seat, through a man hole. Thankfully I was given a hard hat to wear and a head torch. While being winched down you became very aware of the beautiful stone that sparkled with the light from the head torch. Once at the bottom I realised how wet and muddy it was,also how small the corridors and caves were but also how wonderful to see all the fossils and orange iron deposits. 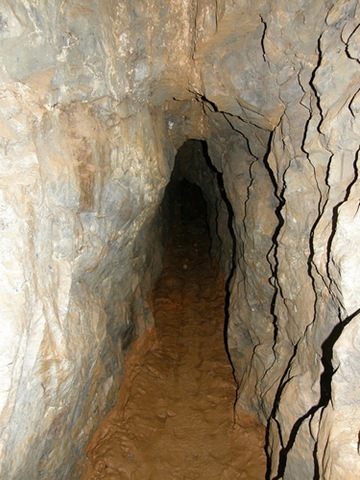 We spent 3 hours walking, crawling and sliding through tiny gaps,amazing to think these used to be working mines where men/boys spent hours chiseling away for the lead. A truly wonderful day and many thanks must go to Maggie, Liz, Nick and The Wirksworth Mines research group for making it all possible. After we all got safely out the mine Maggie gave us much needed refreshments and treated us to a tour round Overton hall. Going up on the roof was the highlight for me, the views were spectacular and we got to see the beautiful Greenhouse and gardens. It was hard to pick just 3 photos to post here as 273 fantastic photos were taken but they can all be seen here . This entry was posted in Personal on August 18, 2008 by Sally. Wow that must have been a great day.. Sadly I’m not too good in enclosed spaces. What a wonderful day you had, with so much fascinating stuff to see and learn! What courage you have. Admire your spirit to have a go immensley. I could not hae coped with the dark and small spaces, that drop 80ft in to a small space would have “did me.” completely. I am so glad you had such an exciting and enjoyable time. Well done you for giving it a go. A day I am sure you will never forget. That looks very exciting and very interesting, I don’t think I’d be brave enough though to go into such a confined space! Wow! that sounds like a fantastic day 🙂 I don’t think I am brave enough to go in such an enclosed space though. I am going to check out the rest of the photos now!